It’d be nice if we could go through our lives with a perfect set of teeth, but some of us are born with gaps or misaligned teeth. Maybe you weren’t born with it, perhaps you got a chipped tooth or a fracture in one, or maybe you just don’t like the color or shape of your teeth. Thankfully for situations like these, there is a cosmetic solution that can give you that perfect smile you’ve always dreamed of, in fact, there’s two! If you’ve discussed this with your dentist no doubt you’ve heard of dental bonding and veneers, but what are the differences between the two? 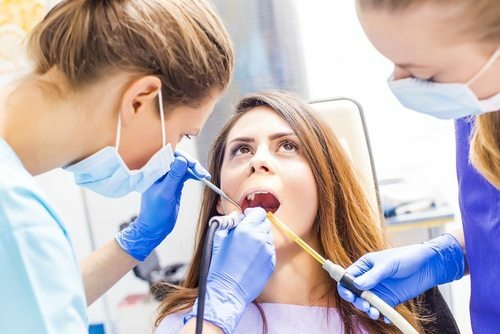 Dental bonding is a term referring to the use of a composite resin or plastic used to correct problems in existing teeth that have chips, fractures, or discoloration. Additionally, it can be used to fill gaps in the teeth or create a visual correction for misalignments and is often used as a substitute for fillings to maintain a more natural appearance for teeth. Bonding is quick and easy to apply and requires very little prep, and can often be completed in a single visit. However, bonding is subject to discoloration and thus will become more evident on your teeth over time. Additionally, they lack the translucent nature of porcelain veneers and thus are fairly easy to distinguish from natural tooth material. These are decidedly the Cadillac of cosmetic dentistry, providing a high quality, durable, and stain resistant covering for your teeth that can stand the test of time. They appear very natural thanks to their translucent nature, and while some care has to be taken not to overly stress the veneer (no cracking nuts or chewing ice with veneers!) they are otherwise as durable as natural teeth. Porcelain veneers require quite a bit more prep-time than veneers, as a layer of enamel must be removed from your teeth to make room for the veneers and a mold sent out to create your cover. Once the new veneer returns from manufacturing, it can be adhered in just one visit. The process often covers three visits and several weeks, but the results are beyond compare. Largely this decision is going to be a financial one. Porcelain veneers are much more costly than dental bonding, and so your ability to afford them is going to be a major consideration. However, if you’re in a hurry to have the appearance of your teeth corrected (say for an upcoming wedding or High School Reunion), then the expediency of dental bonding is likely going to appeal to you. Both options are excellent for improving the overall appearance of your teeth and dealing with unwanted gaps, chips, and other imperfections in your smile. Speak with your dentist to determine which of these two options are appropriate for your situation, and then take some time to consider which you feel is correct for you. Whichever way you go, a beautiful smile is in your future!